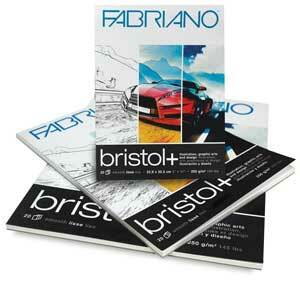 Fabriano Bristol+ is an artist paper that rivals all others. This 145 lb (250 gsm) bristol has a bright white color and an incredibly smooth texture that holds a line extremely well. Ideal for ink, felt-tip pens, solvent-based markers, watercolors, gouache, graphite, charcoal, and airbrushing.